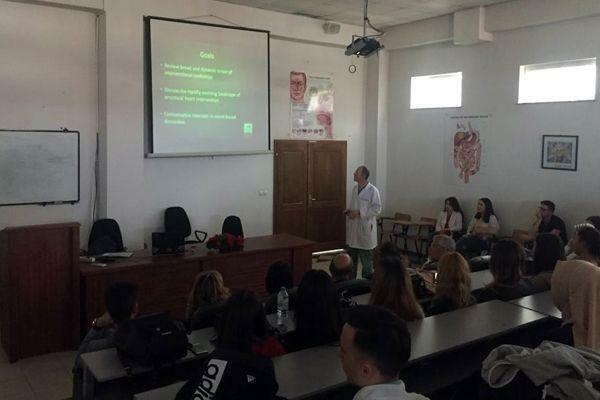 Within the activities for marking April 7th, World Health Day, on April 10, 2018, in the premises of the Faculty of Medical Sciences of the University of Tetova, this faculty in cooperation with the Scientific Group and the Student Parliament organized a lecture on human health awareness with the American doctor, Dr. Dane Sobek. Dean of the Faculty of Medical Sciences, Prof. Dr. Nasir Bexheti, said that the organization of professional lectures conducted by various international doctors is a great help both for academic staff and students, because the lecturers in front of them present personal experiences in different fields of medicine. 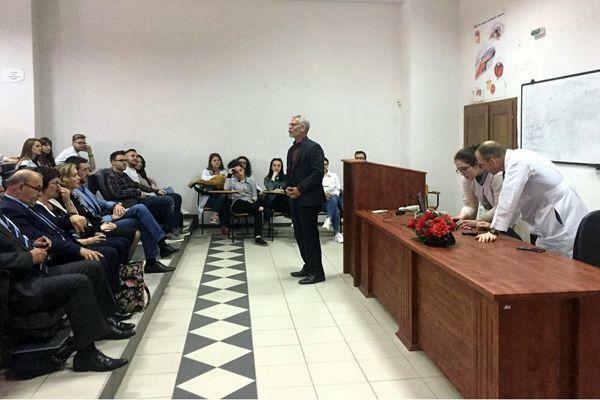 To the professors and students of the Faculty of Medical Sciences with occasion speech addressed Dr. Timothy Gaul. 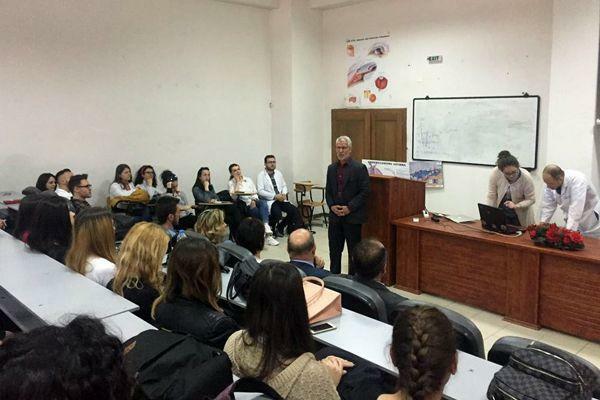 He said he is very satisfied for the cooperation with the Faculty of Medical Sciences of the University of Tetova, in particular with the Scientific Group and students. 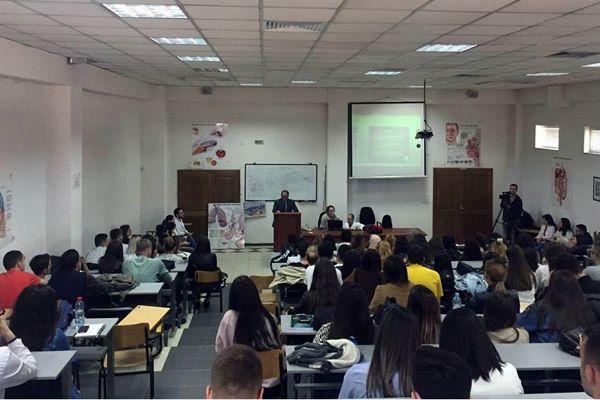 He said that students were very active in all activities carried out within the project titled “American Doctors in Macedonia”. While the American doctor, Dr. Dane Sobek, an intervention cardiologist, during the presentation of his lecture was focused on the field of interventional cardiology as one of the specialized branches for the treatment of cardiovascular diseases. 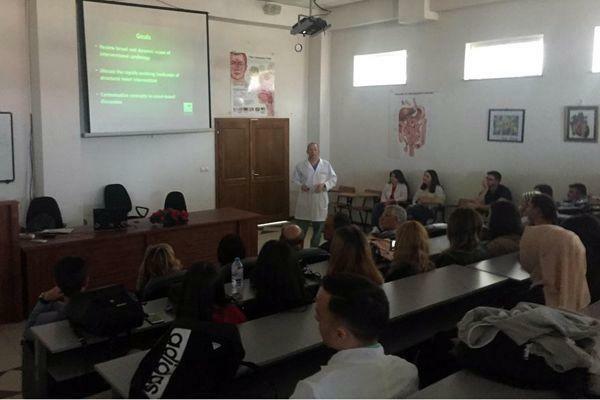 He paid special attention to the newest method of the stents and their application, focusing on the prevalence of the occurrence of these diseases worldwide. This year, the World Health Organization, on April 7, World Health Day, marked it with the motto “Health for everyone” and set the field of cardiology as the main topic to be treated. In honor of this day, students and professors of the Faculty of Medical Sciences organized a march with the motto “Marching for health”.